Cultural Compulsive Disorder: The Jacked Kirby Podcast: Episode #33 - Jack In The House of Mystery!!! 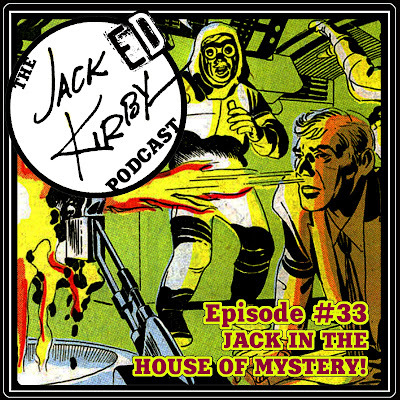 The Jacked Kirby Podcast: Episode #33 - Jack In The House of Mystery!!! Kirby’s early days at DC Comics saw him doing a variety of genres, most notable in the anthology series House of Mystery. Mike D., TL, and guest Sam James Jr. run through the stories he produced for the book in the late ‘50s, ranging from sci-fi to the macabre! As usual big shout outs to our super producer Rob Martin for making the podcast sound unbelievable and getting the show post week in and week out!!!! Also shout out to Sam for joining us a second time!!!! Episode #33: Jack in the House of MYSTERY!!! Bounty Killa - Look Into My Eyes!! !